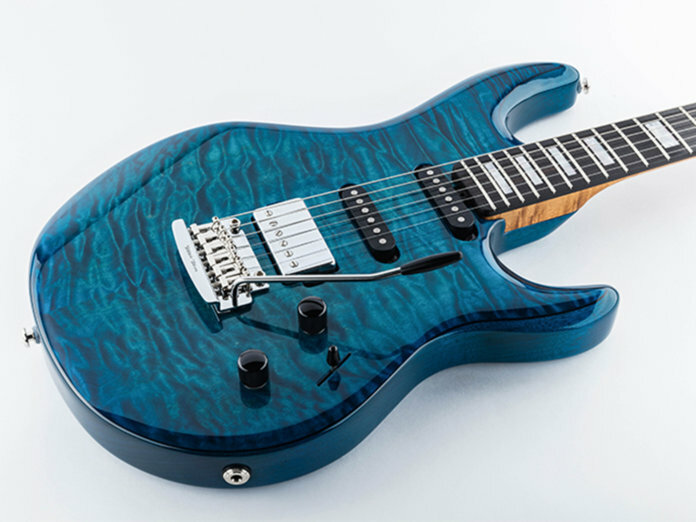 To celebrate 25 years of Steve Lukather’s famed “Luke” guitar, Ernie Ball Music Man has released a special anniversary-edition signature model. Dubbed the “LIII”, this exclusive model will receive custom aesthetic and sonic appointments – and only 25 pieces will be made available worldwide. The guitar sports a quilted maple top decked in an eye-catching Bermuda Blue finish. On its roasted maple neck sits an ebony fingerboard that’s adorned with ornamental pearloid block inlays. Unfortunately, unlike the standard models, there are no options when it comes to electronics. Nevertheless, it comes stock with a new custom-designed bridge humbucker – that’s wound to be extra hot – paired with tried-and-tested Cutlass single-coils. There’s a five-way pup selector, a “Tone” knob, and a “Volume” knob that features a push/push function for a gain boost up to 20dB. Elsewhere, the axe has a laser-etched “LIII” logo on its headstock and locking Schaller tuning posts. Retails at $3,499. More info at music-man.com.